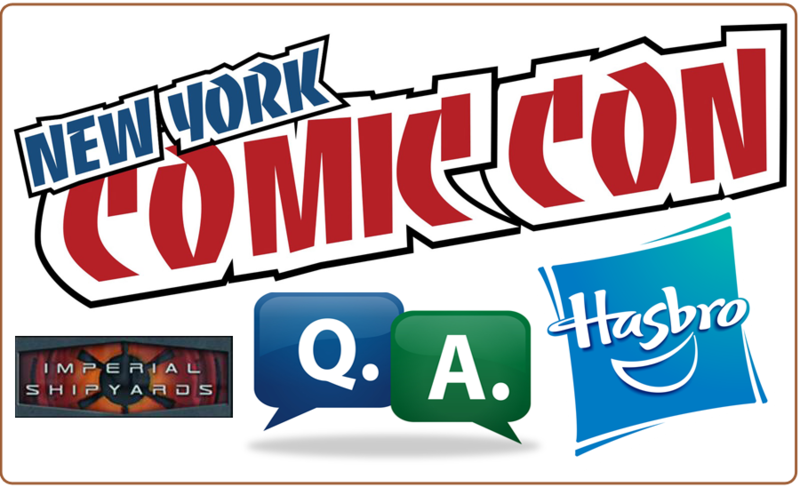 Our good friends at Imperialshipyards were able to get some Q&A time with the Hasbro team at New York Comic Con over the weekend. They are doing the fan community a great service once again as they did their best to get questions that matter to the 3.75″ fans posed to the Hasbro team, with friendly suggestions to make the 3.75″ action figure brand a more appealing product again. Toy Fair didn’t provide much of anything worthwhile from Hasbro this year on the Star Wars front, but we ‘d be remiss to not mention a couple of Q&A sessions that Hasbro held with our friends at Imperialshipyards and Jeditemplearchives during the event. Check them out by clicking on their respective links and see what Hasbro had to say! Our friends at Imperialshipyards recently hosted a great customizing challenge that churned out some fantastic customs. Head on over to their forums and check out the great figures made by members of the community after the jump! Enjoy Episode 76 of Custom Action Figure News as our friends at Imperialshipyards interview the great custom artist know as Sjefke. Listen to them stroll down through his custom work including Cane Addiss, Wam, and his great new Wookiee Gal. As always, they make time for Whats on the Pegs – check out the video link here. Our friends at Imperialshipyards have continued their podcast video format as Dayton Allen aka Sith_Fire_30 has rejoined them for their latest update. He gets into all his great new ALIEN, ALIENS, Prometheus, Blade Runner, and of course Star Wars Custom Action Figures and Dioramas. As many in the community know, Sith_Fire_30 is a great ambassador for customizing in general and he gives viewers some tips, new techniques, and some especially promising new product information to make your customizing easier and better! Check it all out after the jump! Our friends at Imperialshipyards recently began a new video format with their Custom Action Figure News podcasts, and kicked off the new format by interviewing a well-known customizer around the community, Chad Peak aka Peakob1. Kick back and enjoy his story by clicking on the above image, which showcases many great customs, check out his customizing tools, and learn a custom tip or two. They also made time to do their Star Wars What’s on the Pegs feature, and talked about the new Walgreens Exclusive Boba Fett. And if you get tired of looking at their mugs you can go to the CAFN Archive Page and download Episode 70 to your favorite device! We recently jointed forces with our good friends at www.imperialshipyards.net through a joint customizing event to create some “REBELS” themed custom figures. The event has now concluded, and we have a lot of great figures to show in the Roundup Report – and even a Random Prize Winner to announce too – so kick back and check it all out after the jump! The fan community was recently exposed to Hasbro’s upcoming Rebels line, which has been met with mixed results as so many of us prefer good articulation and more detailed sculpts with the Star Wars lines rather than what Hasbro revealed. Soon after, we teamed up with Imperialshipyards.net to host a customizing event where fans can make their own Rebels themed customs and have a chance to win some cool prizes. While the number of entries has been somewhat modest thus far, the quality has been fantastic. To check out the latest entries, click here – and remember, entries will be accepted until the end of April.